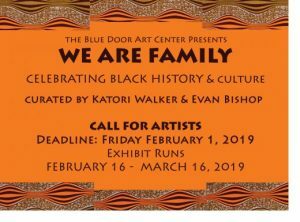 We Are Family – An exhibition of visual artwork celebrating Black History and Culture at the Blue Door Art Center. Come and see paintings, sculptures and more as we join together in an expression of art and culture. Curators by Katori Walker and Evan Bishop. Opening reception on Saturday, February 16 | 6 – 8:30pm. Meet the artists, ejoy wine & cheese, add a piece to your collection. The Blue Door Art Gallery is an excellent place to see established as well as upcoming artists. The exhibit runs Feb. 16 – March 16. Gallery Hours are Thursdays and Fridays 3 – 6pm and Saturdays 1 – 5pm. All Welcome, no cost. If you would like to participate, the call for artists is open until February 1. The Blue Door Art Center is located at 13 Riverdale Ave, in Yonkers, NY just a short walk from the Yonkers Train Station. This entry was posted in Press Releases and tagged art, black history, Blue Door Art Center, gallery, opening reception, Yonkers. Bookmark the permalink.